The Giunchi family has been welcoming his guests in Cervia for over 35 years and it is happy to welcome you and your family to the Hotel Kiss. The hotel stands in a particularly privileged location, directly on the sea and next to the pinewood. Realized according to a modern and charming design made of steel and teak wood, it will give a feeling of being on board a sailboat. It has a wide hall with bar overlooking a pleasant garden. In the restaurant room with sea-view, our kitchen team prepares not only the traditional dishes of the Romagna region, but also international dishes. The WiFi cover is guaranteed over the entire hotel and it is free. We work together the bathing establishments "Bagno Balmor" and "Bagno Saretina", which have been managed for years by the same owners and are equipped with every comfort. 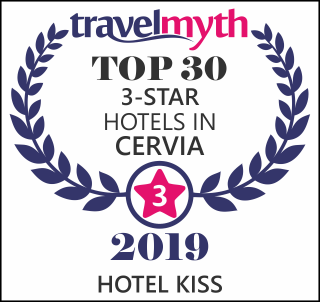 Cervia has been flying the “Blue Flag” since 1991! A 2-km stroll on the promenade will lead you both to the Harbour to admire the historical “Vele al Terzo”, and to Cervia historical centre, which hosts weekly theme street markets. Downtown Milano Marittima with its boutiques is only 4 km away. Cervia Thermal Baths and the Golf Club can be found instead inside the pinewood and can be reached by a shuttle starting from the hotel entrance.